MacGyver ain't got nothing on me. I saved a litter of newborn puppies from a hoard of zombie honey badgers with just a thimble and some hand sanitizer last night. And I didn't even break a sweat. And everybody was like Way to go, Mandy! You’re frickin amazing! Not really. But I did make a wicked easy dessert with nothing more than a can of crescent rolls and stuff I had in the pantry. And the onions totally think I’m a rock star for being able to whip up a warm, gooey, flaky, peanut butter stuffed chocolate miracle with scant resources. Wha? Ugh. I’m so not looking forward to having two hormonal girls in the house. But if chocolate will stave off the irrational, emotionally charged drama, I’m on it. So I started snooping around the pantry and came up with a bag of mini chocolate chips. Hmmm. I was thinking of making muffins but really wasn't up to dragging out the flour and the sugar and the baking powder and the milk and the… So I opened up the fridge, hoping to find inspiration there, and spotted the can of crescent rolls. 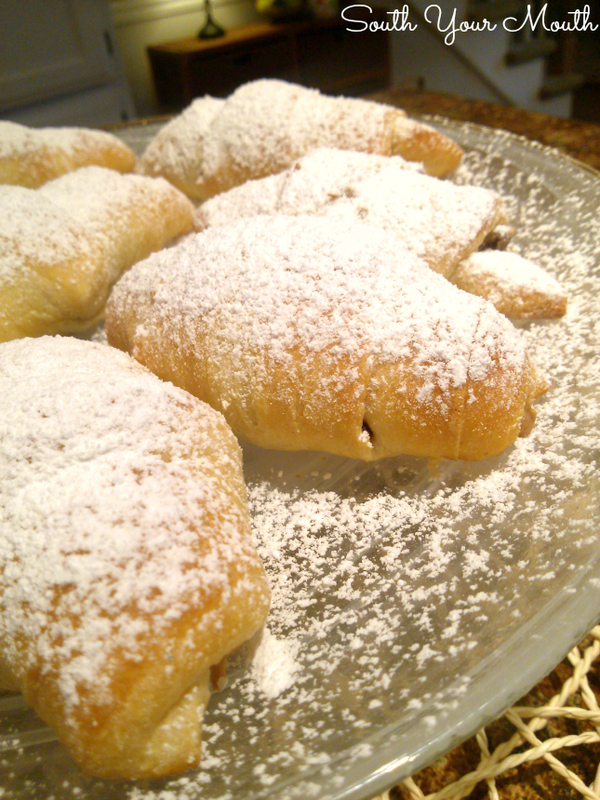 A few globs of peanut butter and shakes of powdered sugar later and we were wolfing these things down like pros. They’re best when they’re still warm but a few seconds in the microwave cures the leftovers just fine. Separate dough into the 8 preformed triangles. Spread 1 heaping tablespoon of peanut butter onto the wide end of the triangle (do not go all the way to the edges of the dough with the peanut butter or it will melt and ooze out all over the place). 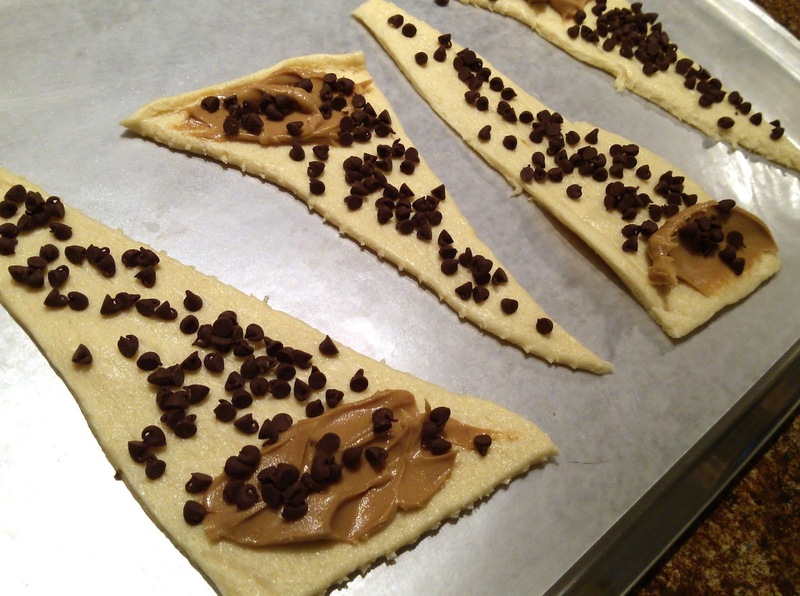 Sprinkle chocolate chips evenly over dough. Roll each triangle per manufacturer’s instructions, starting with the wide end. Place crescents two inches apart on a baking sheet that’s been lightly sprayed with cooking spray. Bake at 375 degrees for 9-11 minutes or until dough is light golden brown. Remove from oven and immediately sprinkle with powdered sugar. To get that "bakery perfect" look with powdered sugar, simply dump some powdered sugar into a mesh strainer or sifter then tap the strainer against your hand over your target. Serve warm. Store any leftovers in an air-tight container at room temperature then slightly reheat in the microwave if desired. Oh. My. Gosh......you are speaking my language, sister!!! I need to leave work right. now. 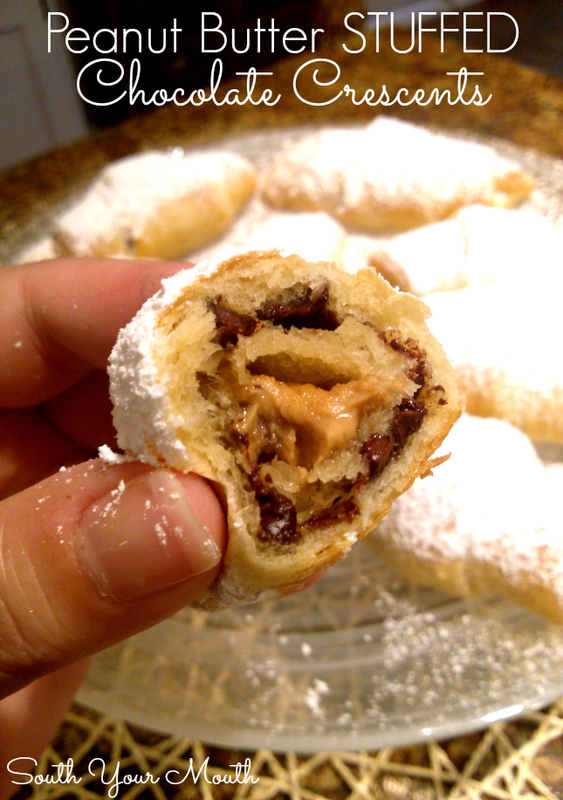 to go home and make some of these. So simple.....why didn't I think of this?!?! GO! GO NOW! Your boss said it was OK!! These were soooo easy to make and tasted great! I also added butterscotch chips to mine and was thinking, while I was eating one, "I bet these would be good with a dab of jelly in the middle too". Quick, Easy, inexpensive and tastes great too..what more could you ask for. Hey Mandy, I have never tried the peanut butter but I have used hazelnut spread. I also make them with a dollop of thick jam and put a confectioner's glaze on after they cool a bit. My favorite way is to spread some pesto on them and sprinkle with Parmesan cheese. Great with pasta dishes. Norma in NC. My ‘Olfactory’ just shut down and went on strike until I make these. I’m so glad I left my 10 lb.Vollrath in our church back in NY. I know I couldn’t resist taking these for a dip in the deep fryer. And you, sir, just made my mouth water. A easy, not-too-sweet treat. Definitely pour yourself a tall glass of milk with these.